Go inside the Medicare administrative contractor program to learn how to develop a strong defense against denials. During these uncertain economic times, businesses across the country are doing everything they can to stay fiscally solvent. The healthcare industry is no different. One of the newest challenges facing healthcare organizations is the expansion of government and private payer audits. Recovery audit contractor (RAC) audits alone have resulted in hospitals seeing millions of dollars in already-recognized Medicare revenue rescinded by the Centers for Medicare & Medicaid Services (CMS), putting some hospitals near the brink of bankruptcy. Unfortunately, the RAC program is only the most famous of the current spate of audits facing hospitals, which also includes those being performed by Medicare administrative contractors (MACs). The good news is that provider organizations can inoculate themselves to a certain extent against MAC audits by implementing appropriate policies and taking valuable steps that can dramatically improve their efficiency in responding and appealing. This article provides background on the MAC audit process and details specific preventive approaches relating to the appeals process that can help hospitals retain more of their earnings under this new, intricate system. The MAC program, created under the Medicare Modernization Act of 2003, was designed to improve services to providers, physicians, and practitioners while making the entire Medicare program more efficient. It brought together the processing functions for both Medicare Part A claims (hospital claims) and Part B claims (physician claims) with the intention of giving Medicare providers a single, primary point of contact for the receipt, processing, and payment of Part A and Part B claims. However, MACs’ primary task is to ensure prompt and accurate payment of the 1.2 billion claims submitted annually for Medicare-covered services. Beginning in 2005, Medicare began a bidding process for 15 new regional contractors and has plans to install a full implementation across the United States by October 2011. Besides conducting prepayment and postpayment audits, MACs are also the primary point of contact for physicians and are responsible for enrolling providers and suppliers into the Medicare program. According to providers, the program’s most important function is customer service—MACs are required to educate providers on billing requirements and directly answer provider inquiries. In addition, all beneficiary calls to the 1-800-MEDICARE hotline are forwarded to the respective MAC. Using software developed by the CMS, MACs are charged with determining whether particular billed services are medically necessary and hence should be covered by Medicare. Each MAC can access provider inquiries and review claims to identify ambiguities or other irregularities in the system. The MAC is then responsible for using this data to inform providers about coverage requirements. MACs have the ability to add local edits to the automated system to denote specific issues relating to its jurisdiction. With 15 MACs across the country, provider payments may be readjusted based on geographic reasons, specific provider characteristics, or the beneficiary’s copayment requirements. 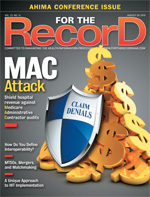 MACs conduct random prepayment reviews of Medicare claims to identify erroneous payments up front. Sending forms by mail to provider organizations, the MACs typically ask for information regarding a patient’s name, date of service in question, instruction on what records to send and where to send them, and the time frame in which to submit. Known as probe samples, these initial provider requests usually target between 20 and 40 inpatient or outpatient service records. Besides being randomly selected by a MAC, hospitals can also be targeted for specific reasons. MACs may have received input from specific patients who had experienced inappropriate care or another government agency involved in auditing or investigating fraud and abuse could have forwarded information that would warrant a MAC audit. In addition, MACs utilize data-mining technology to search for trends and noticeable irregularities. When reviewing volume criteria, physicians who are billing a high volume of claims may also be targeted. Just as in a RAC audit, MACs also examine already-paid claims for indications of improper payments. If Medicare has informed a provider that it has retroactively denied certain charges and determined that funds will be withheld from future payments, there is an appeals process in place. Known as the redetermination phase, the MAC will be the initial reviewer in an appeals process. Claim denials or overpayments must be brought to a MAC’s attention within 120 days of the initial decision. When sending an appeal, a provider must include the beneficiary name, the Medicare health insurance claim number, the specific service and/or item for which the redetermination is being requested, the specific date of service, and the name and signature of the provider or the provider’s representative. MACs must respond to a redetermination request within 60 days of receipt. If a provider is unsuccessful in its appeal, it can then take its position through a series of four additional appeals processes. There is a variety of proactive measures a provider organization can take to win an appeal against a claims denial. First, it should check into whether the MAC has issued guidance covering the claim at issue. An appeal letter must be clear and concise, mapping out all arguments in support of payment, providing applicable documentation, responding in a timely manner, and ensuring the patient’s name is on each record or piece of information that is being submitted. It is important to double-check that the physician’s name is legible on the record and that he or she has signed progress reports. Any significant errors in the denial notice may serve as strong grounds for appeal. It would also be wise to fax the appropriate documents in addition to mailing for documented proof of submission. One of the most effective measures an organization can implement to maximize its ability to prevent denials and win appeals is establishing a strong utilization management committee. For example, such a committee could help combat “wrong setting” denials, which occur when it’s deemed that the hospital has provided patients with unnecessary care, typically for admitting them for inpatient services that the CMS has generally determined should be conducted on an outpatient basis. A primary goal of the utilization management committee should be to implement a set of strong, well-researched, defensible guidelines to ensure consistent admission screening. • Be sure to utilize Medicare’s and other payers’ published lists of level-of-care guidelines for specific procedures. These provide a strong foundation for establishing that certain types of care can be acceptably rendered as inpatient services. • Develop defensible criteria for “gray-area procedures” that are sometimes billed as inpatient and other times as outpatient. Incorporating medical evidence from reputable medical journals that can back up an admission decision will greatly increase the likelihood of winning an appeal. • To ensure consistent admission practices, assign a case manager who has the authority to override screening criteria when necessary to approve inpatient cases on the sole basis that it can be clinically documented. In addition to establishing a utilization management committee, there is a variety of administrative tasks that a hospital can undertake to increase the odds of avoiding denials. Even though there has been a strong push for EHR adoption, there are many facilities that still have a hybrid medical record system containing both electronic and paper records. Hospitals must have a documented full inventory of where all medical records are stored. Ensuring all medical records are complete and HIPAA compliant prevents MACs from denying a claim due to a missing document, signature, date, or other administrative reason. Prior to submitting an appeal, be sure documents are placed in chronological order for easy reading and to make the MAC’s job easier. It is also important to assign a particular case manager to work with the MAC in case there are questions regarding any appeal document. Establishing a relationship and being responsive to the MAC’s needs can do no harm. • Knowledge base: A good tool will come with letter templates, appeals strategies, and other content to arm providers with the information that only experience can provide. • Workflows: MAC appeals can involve many departments and individuals collaborating to meet deadlines. Look for tools that have both prebuilt workflows as well as the flexibility to modify or design processes to fit an organization’s specific needs. • Hosted software-as-a-service model: Keeping up with changing requirements and incorporating new best practices is difficult with software that arrives on CD. Hosted applications offer frequent content and functionality updates as well as fully functional remote access. • Easy-to-use streamlined interface: Good tools must be fast and easy to use, with controls that are intuitive enough that even the technologically handicapped can use them. The MAC program was implemented to make Medicare claims more manageable and efficient, but there already has been a variety of problems reported. Specifically, the Government Accountability Office has determined that implementing the MAC program has overlapped other Medicare initiatives, affecting claims processing and resulting in payment delays. Additionally, the contractors themselves have not met all performance standards (eg, customer service, responding to appeals). The American Medical Association (AMA) has also weighed in with concerns relating to how MACs are awarded. By having competitive bidding for contracts, the AMA believes it may lessen the quality of service that providers can expect. MACs are currently funded at significantly lower levels than in prior years. The AMA is aggressively advocating that additional resources be put toward physician education and knowledgeable MAC customer service agents. Another challenge that is currently affecting both hospitals and providers is the HIPAA 5010 and ICD-10 transition. HIPAA requires payer organizations to accept ICD-10 coding by October 1, 2013, and support the corresponding HIPAA 5010 transactions by January 1, 2012. The ICD-10 coding system is being incorporated as a way to assist hospitals with more accurately documenting patients’ medical conditions and procedures. However, despite the fact that additional coding options are meant to eventually lessen the degree of confusion between all parties, the transition will likely have the opposite effect in the short term. As the deadlines approach, both sides (payers and providers) can benefit if proper training is completed ahead of time. The increased specificity of codes will make it easier for hospitals to denote treatment for all ailments but will require significant changes to coding procedures and level-of-care guidelines. Providers that are not up to speed with ICD-10 coding may be more likely to face MAC audits. It is essential that all players in the process conduct appropriate research and training to ensure the ICD-10 conversion is as seamless as possible. The CMS is requiring that MACs undergo a certification process by December 31, 2010, to accommodate the compliance deadline. It would be appropriate to describe the MAC program as unsettled. Given that MACs have recently rolled out across the nation, there has not been any significant data released to determine the program’s success. However, if early statements by providers ring true that MACs have been inconsistent in various ways, then the program may need to be reevaluated. Initial reports suggest some jurisdictions have had more success than others depending on how well a MAC has performed its duties, particularly in terms of communication and responsiveness to billing inquiries. By having nonautomatic contract renewals, providers may have the leverage they need in getting reforms made to the MAC program. As reoccurring and additional challenges emerge, it will be interesting to see how each independent MAC addresses them. As the MAC audit process works itself out, provider organizations will be well served by investing in strong utilization management research and internal policies. This work will not only support the organization in any kind of audit—be it MAC, RAC, Medicaid integrity contractor, or a private payer—it will also help reduce friction and enhance productivity as administrative and clinical teams work together to marry quality care with efficient business operations. — Mary Guarino is the vice president of regulatory at ClaimTrust, Inc.